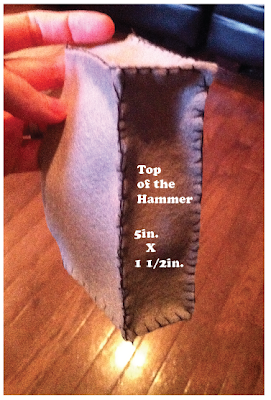 Here is the instructions on how to make a plush Thor's Hammer! This is actually pretty easy and it turns out SO CUTE! 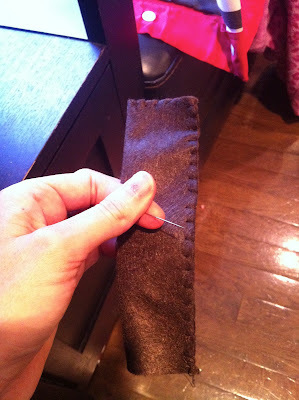 It is all hand stitch so anyone with a needle and thread can do it! The first thing you are going to make is the handle. 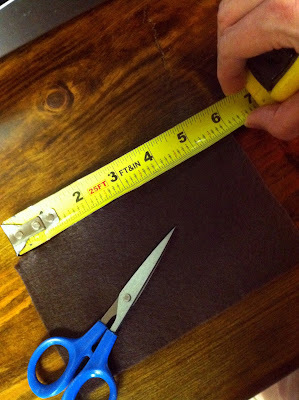 Measure and cut out a square of brown felt 6 inches by 3 1/2 inches. 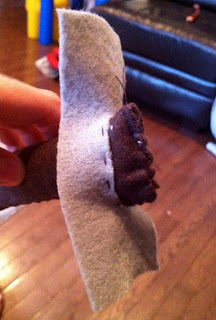 Fold the felt in half and hand stitch the bottom and side, leaving an opening at the top. 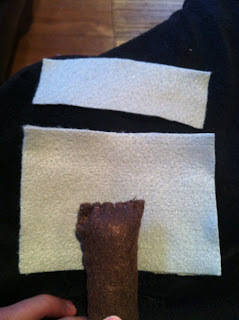 Then turn the felt inside out....like the picture on the right. 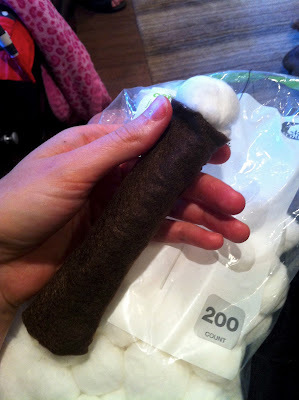 Stuff the handle with cotton balls till it feels tight and sew up the opening! 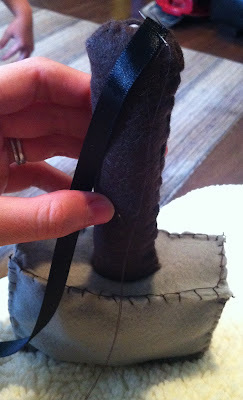 Now you are going to cut out the pieces of gray felt for the top of the hammer. The front and back panels are 5 inches by 3 1/2 inches. The top and bottom are measured 5 inches by 1 1/2 inches. The two side panels are 3 1/2 inches by 1 1/2 inches. So you will have to measure and cut out two of each size. 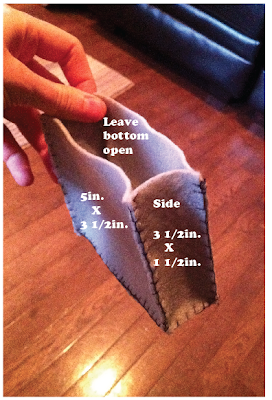 You are going to hand stitch the sides together, leaving the bottom open! 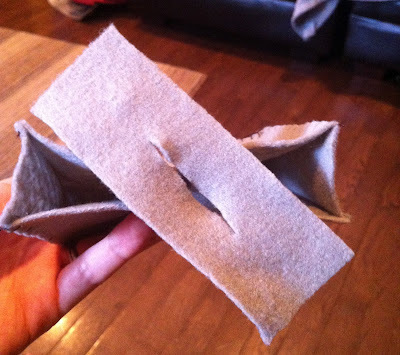 With the bottom piece of felt, cut an opening about an inch and a half so the handle can fit into it. 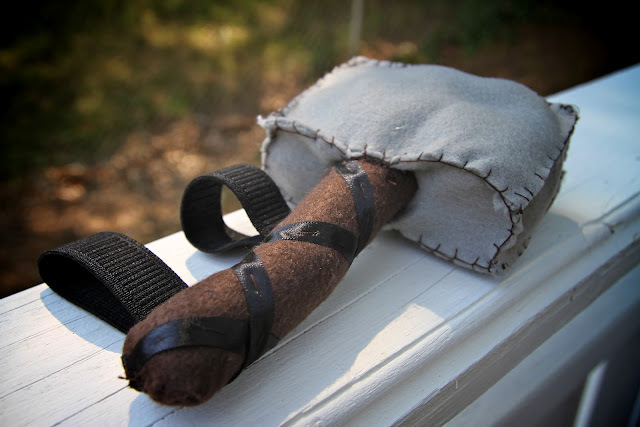 Just slightly put the handle through the slit and stitch it together. 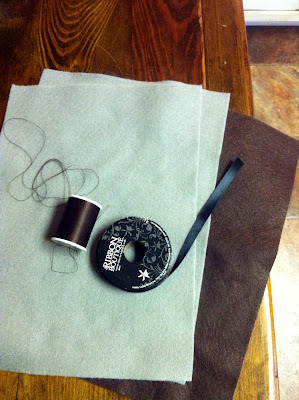 Now, start stitching the bottom on and when you are almost done start stuffing it with cotton balls. When it is filled stitch it up! 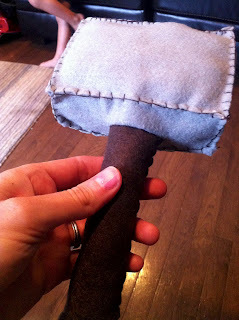 This next step you don't have to do but it really makes the hammer look cool! 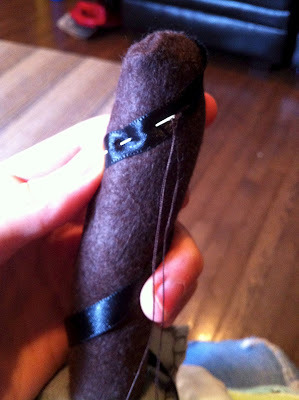 I just stitched some black ribbon around the handle as pictured below. I found that the top of the hammer was a little floppy so I stitched the middle bottom seam to the handle for extra support! 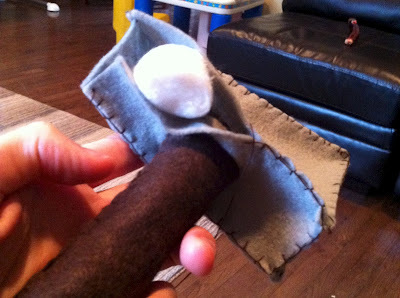 Then if you are making this for an infant who can't hold onto the hammer you can add black elastic to the handle. 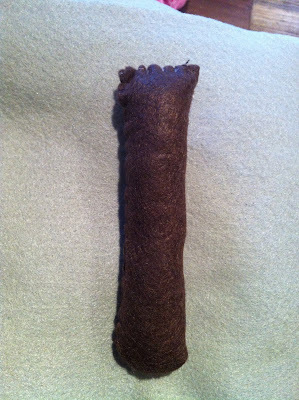 I measured the elastic around my babies wrist and then also up his arm a little. 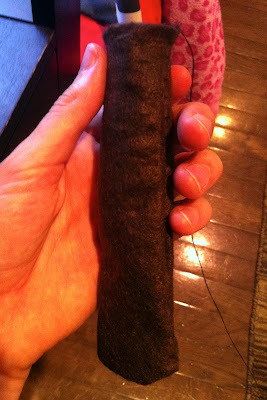 Then I simply stitched it to the handle. Here is my two month old "holding" his hammer! 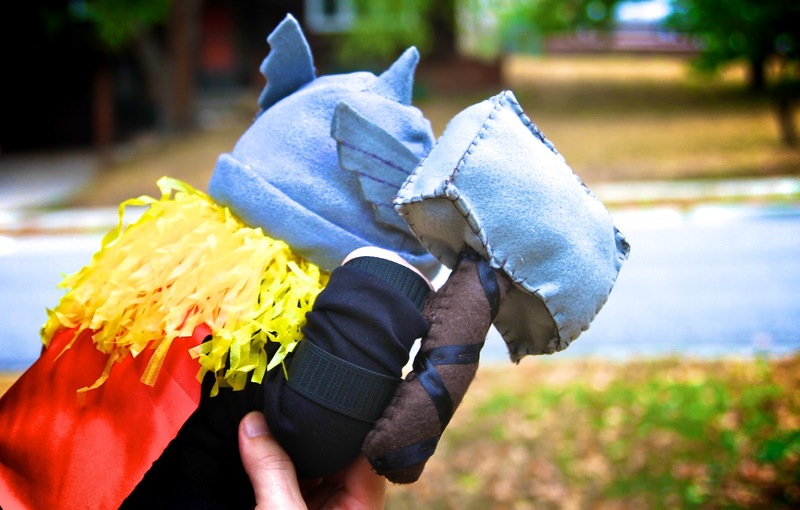 If you missed my first post on how to make an infant/toddler Thor costume click HERE! 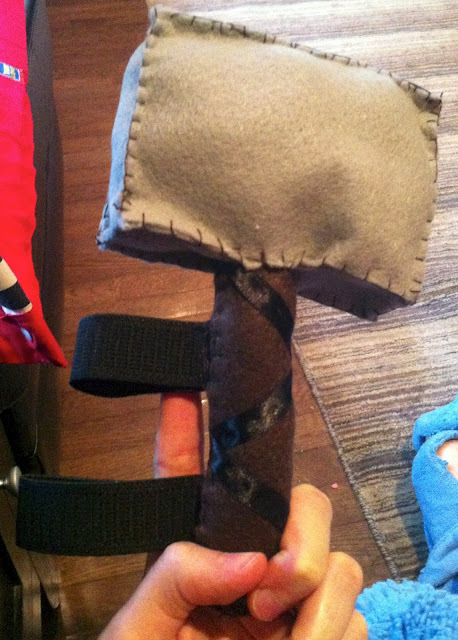 For the instructions on how to make Thor's hat click HERE!